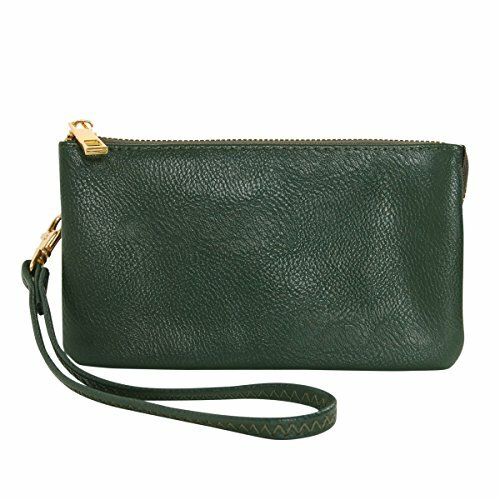 Humble Chic Vegan Leather Wristlet Wallet Clutch Bag - Small Phone Purse Handbag, Hunter Green, Dark Forest Green, Olive | What Should I Say? ELEGANT DESIGN & SUPERIOR QUALITY - This compact mini vegan leather wristlet features a streamlined exterior with a highly compartmentalized expandable interior to organize your essentials in style. Holds iPhones and other popular smartphone or cell-phones under 6.5 inches with a slim case. AUTHENTIC BRANDED ITEM - Humble Chic NY is a registered US trademark and the only authorized seller of the original Small Wristlet - Vegan Leather - Hunter. The perfect present for yourself, birthdays, anniversaries, mom, and more. SIZING - Approximate Measurements: 4" x 7" with 9" removable wrist strap. Multi-function with 3 separate compartments, 6 credit card and ID slots, and 1 zip-top change purse.